Survivanta fragmento de lamapop de Piri Reis montranta la marbordon de Centra kaj Suda Ameriko. La aldonaj notoj diras "la mapo de okcidentaj landoj desegnitajn de Kolumbo"
La Mapo de Piri Reis estas mondomapo kompilita en 1513 de la militista spionaro de la otomana admiralo kaj kartografo Piri Reis. Proksimume unu triono de la mapo survivas; ĝi montras la okcidentajn marbordojn de Eŭropo kaj Nordafriko kaj la marbordon de Brazilo kun sufiĉa akurateco. Variaj atlantikaj insuloj, inklude Azorojn kaj Kanariojn, estas priskribitaj, kiel la mita insulo de Antilio kaj eble Japanio. La historia gravo de tiu mapo kuŝas sur sia montro de etenda kaj kompleta esplorado de la Nova Mondo ĉirkaŭ proksimume 1510, kaj sur sia postulo esti uzinta mapojn de Kristoforo Kolumbo, aliflanke perditajn, kiel fonto. Ĝi uzis fakte arabajn fontojn, kvar hindiajn mapojn havitajn el portugaloj, kaj unu el Kolumbo. Pli ĵuse, ĝi estis la fokuso de historifalsaj postuloj pri la antaŭ-moderna esplorado de la marbordo de Antarkto. Afetinan, A.; Yolaç, Leman (trad.) (1954), The Oldest Map of America, Drawn by Piri Reis, Ankara: Türk Tarih Kurumu Basimevi, pp. 6–15. Afetinan, A. (1987), Life and Works of Piri Reis: The Oldest Map of America (2nd ed. ), Ankara: Turkish Historical Society, OCLC 19674051. Hapgood, Charles H. (1966), Maps of the Ancient Sea Kings: Evidence of Advanced Civilization in the Ice Age, New York: Chilton Books, ISBN 0-8019-5089-9. Deissmann, Adolf (1933), Forschungen und Funde im Serai: Mit einem Verzeichnis der nichtislamischen Handscriften im Topkapu Serai in Istanbul, Berlin: Walter de Gruyter. Flem-Ath, Rand; Wilson, Colin (2000), The Atlantis Blueprint, Great Britain: Little, Brown and Company, p. 18, ISBN 0-316-85313-5. Kahle, Paul E. (Oktobro 1933), "A Lost Map of Columbus", Geographic Review, American Geographical Society, 23 (4): 621–638, doi:10.2307/209247, JSTOR 209247. Kahle, Paul E. (Aprilo 1956), "Piri Re'is: The Turkish Sailor and Cartographer", Journal of the Pakistan Historical Society, 4: 101–111. McIntosh, Gregory C. (2000), The Piri Reis Map of 1513, Athens, Georgia: University of Georgia Press, ISBN 0-8203-2157-5. Mollat du Jourdin, Michel; La Roncière, Monique; le R. Dethan, L. (trans.) (1984), Sea Charts of the Early Explorers, Thirteenth to Seventeenth Century, New York: Thames & Hudson, ISBN 0-500-01337-3. Nebenzahl, Kenneth (1990), Atlas of Columbus and the Great Discoveries, Chicago: Rand McNally, ISBN 0-528-83407-X. Portinaro, Pierluigi; Knirsch, Franco (1987), The Cartography of North America, 1500–1800, New York: Facts on File, ISBN 0-8160-1586-4. Smithsonian Institution (1966), Art Treasures of Turkey, Washington, D.C.: Smithsonian Institution, OCLC 1027066. Stiebing, William H., Jr. (1984), Ancient Astronauts, Cosmic Collisions and Other Popular Theories about Man's Past, Amherst, New York: Prometheus Books, ISBN 0-87975-285-8. Tekeli, Sevim (1985), "The Map of America by Piri Reis", Erdem, 1 (3): 673–683. Van de Waal, E. H. (1969), "Manuscript Maps in the Topkapǐ Saray Library, Istanbul", Imago Mundi, 23 (1): 81–95, doi:10.1080/03085696908592335. 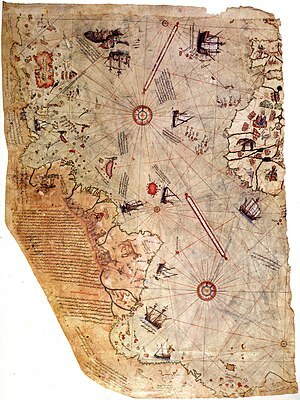 Yerci, M. (1989), "The Accuracy of the First World Map Drawn by Piri Reis", The Cartographic Journal, 26 (2): 154–155. Turkey in Maps: La marĝenaj notoj de Piri Reis, traduko el The Oldest Map of America (Afet Inan, Ankara, 1954). Sacred Text Archive: falsisma studo pri Ferepoka civilizacio, traduko el la mapokomentario. "Piri Reis and the Columbian Theory" de Paul Lunde: ascii teksto el Aramco World Magazine (Jan-Feb 1980). Citat: "...There may, in fact, be an even simpler explanation of the presence of "Antarctica" on the Piri Reis map..."
Fingerprints of the Gods (2001) ascii teksto. Citat: "...William Miller wrote:...The examinations that I have made of it show all sorts of errors that certainly falsify any claim of unusual accuracy for this map..."
The Mysteries of the Piri Reis Map: de Diego Cuoghi. Ĉi tiu paĝo estis lastafoje redaktita je 19:45, 5 mar. 2017.